Prune juice and prunes in general have a long standing association with being able to assist in curing constipation. Constipation occurs when one does not pass a bowel movement for at least three days. It can be the result of a few different factors but the most common are large, firm stool that resist movement or weaker muscles along the bowel and colon that cannot induce the necessary motions as easily. As you will soon see, prunes can address both these matters! 111 grams of carbohydrates. Of these carbohydrates, 12 grams are from dietary fibers. This may not sound like much but it amounts to a whopping 49% of your daily needs. Prunes are also a natural source of sorbitol, which I will elaborate on in a few moments. The most obvious way prunes can keep you regular is with their fiber content. Prunes contain both soluble and non-soluble fiber. Soluble fiber dissolves in water and is absorbed by your body where it then helps in the absorption of other nutrients from your food, improving digestion overall. Non-soluble fiber cannot be digested and passes through your body harmlessly. As it makes its way out, the fiber will bundle up with and add mass to your stool, speeding up its inevitable exit. When stool sits in your colon, water is absorbed back into the body. If this happens for too long, the stool will become firm and hard to pass. 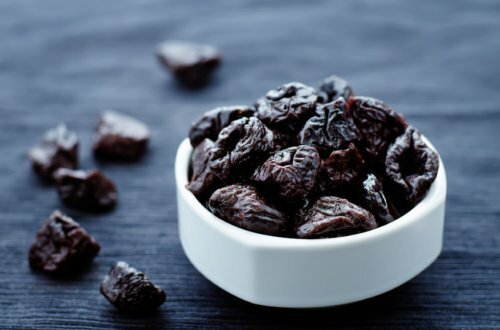 Sorbitol, a naturally occurring compound in prunes, does the opposite and actually helps draw water back into the colon where it can soften and loosen stool. If it helps, picture a wall made of loose clay. Now add water and imagine the clay softening and slipping until one piece falls away. Then another, and another, until the whole thing is flowing away. Sorbitol is so useful it’s also sold as a stand-alone laxative! Be very careful when giving prune juice to an infant or child. You should only give around two to four ounces per day and be ready to lower the amount if needed. Adults can both handle larger amounts and may need more to get the full benefit. A grown individual can drink anywhere from four to eight ounces of prune juice each morning to ensure proper colonic stimulation. It can be tempting to double-up on your glasses of prune juice, especially if you suffer from chronic health problems. This is understandable but definitely inadvisable. Adding more nutrients doesn’t always result in extra benefits and there is a limit to how much bowel improvement fiber can provide. Conversely, taking extra prunes means you run the risk of them working too well and having to deal with potential dehydration as your body voids itself of more water than it should. If you are eating prunes directly instead of using juice, you can adjust your ingestion based on the state of your constipation. Mild cases will call for around three to four prunes per day to see relief. Moderate cases of constipation can be addressed by eating six to nine instead. This level is also useful if you desire to induce a movement but aren’t feeling particularly constipated at the time. Severe constipation warrants a more intense prune level of 10-12 per day. If even this amount does not start showing benefits, consult your doctor. Stewing: Soak one pound of pitted prunes in two to three cups of water in the fridge overnight. The next morning, add the prunes, a little bit of water, and half a cup of orange juice to a soup pan and heat until boiling. Reduce the heat and add 1/4 cup sugar then let simmer for 15-20 minutes. Increase the heat, run a final boil for about two minutes and then turn off the stove entirely. Allow the stew to cool before enjoying. Constipation colonic conqueror: Mix 1/4 cup of apple sauce, 1/4 cup prunes, and 1/2 cup of bran in a bowl. Eat one to two tablespoons each evening or morning alongside six to eight ounces of water or juice. This will result in a dramatic increase of fiber that will help improve your bowel function. Prunes contain something called “oxalates”. These are a type of substance that are fairly benign in normal amounts but in large quantities can interfere with your ability to absorb calcium. As a result, you should compensate for this with an increased calcium intake if you are eating larger amounts of prunes or are worried about developing a calcium deficiency. If you have a history of kidney or gallbladder problems or kidney stones, you may need to be extra careful since unabsorbed calcium can contribute to those ailments. As mentioned above, the dosage is very important when dealing with prunes. Your body does not handle “excesses” well and eating too many prunes can cause bloating, gas, stomach cramps, and possibly diarrhea. Be aware of the signals your body is sending you and dial back on the amount of prunes you are eating or drinking should you develop these symptoms. Constipation is normally the result of stool sitting in the colon long enough to become dry and hard. If your constipation is not showing signs of improvement after trying a prune regiment then it is possible that another cause is to blame and you should consult your doctor. You should also consult a medical professional if you experience rectal pain, blood in the stool (especially black or clotted blood), “pencil-thin” stool, or unexplained weight loss. “Dietary Fiber for Constipation: How Much You Need,” WebMD web site, September 4, 2014; http://www.webmd.com/digestive-disorders/dietary-fiber-the-natural-solution-for-constipation?page=2. “Plums, Dried (prunes), Uncooked,” Nutrition Facts web site; http://nutritiondata.self.com/facts/fruits-and-fruit-juices/2043/2, last accessed December 22, 2015. “Prunes for Constipation,” Home Remedies For Life web site, September 12, 2015; http://homeremediesforlife.com/prunes-for-constipation/. Silver, N., “Can I Use Prune Juice to Treat My Constipation?” Healthline web site, August 31, 2015; http://www.healthline.com/health/digestive-health/prune-juice-for-constipation#1.